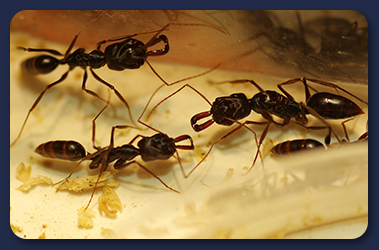 Ants are social insects that live together in colonies and form self-contained communities. In each community there are three castes, namely queens, males and workers. Ants usually nest in garden areas but also frequently build their nests in the insulation layers of houses and from there they penetrate up into the house itself through the cracks which inevitably appear in the concrete and cement. When foraging worker ants get into the house it will soon be seen that they are particularly attracted to sweet substances, such as drops of jam or scraps of cake. As soon as one ant has found the food source, he then returns to the nest at the same time laying a pheromone (scent) trail, once back at the nest the ant can communicate with the other ants by tapping them with it's antennae and also by feeding them with some of the contents of it's crop. The next thing you know the whole nest is at the site where you dropped that sugary sweet. Remove the food sources, i.e. ensure that sugary foods are kept in sealed containers and that all food and drink spillages are cleared up immediately. Some insecticides are applied directly to the ants nest. If the nest can be located (usually on the outside of the building) it may be destroyed by pouring a kettle of boiling water over it. This is advised for problems on a ground floor outside area only. If the nest cannot be found, an insecticide may be used along the cracks and crevices where the ants appear (e.g. skirting boards) and this may provide a 'barrier' against them. Obvious holes in the exterior of the building should also be sealed using a commercially available sealant.